When SOS reviewed the Motif Rack back in June 2003, we were left in a bit of a quandary. Whilst being a great-sounding, versatile synth module with bags of creative potential, the Motif Rack suffered from some serious timing problems. Specifically, this meant that the unit played out of time in response to incoming MIDI messages — not only relatively within itself, but very noticeably when played from within a MIDI sequencer in parallel with other MIDI instruments (see the original review at www.soundonsound.com/sos/jun03/articles/yamahamotifrack.asp for full details). Yamaha acknowledged the problem, and undertook to find the cause and fix it. Changes were subsequently made to the unit in a bid to alleviate the problem, and although matters were slightly improved, the problem was not solved beyond all reasonable doubt. Now, nearly two years later, Yamaha have released an updated model, the Motif Rack ES. The ES features a number of enhancements over the original Rack — but have Yamaha successfully addressed the crucial issue of the MIDI timing? The Voice architecture of the ES has been carried over from the original Rack, details of which you can find in that June 2003 review (for more details of the Motif concept, see the review of the Motif 7 keyboard in SOS September 2001, viewable on-line at www.soundonsound.com/sos/sep01/articles/yamahamotif7.asp). Briefly, the Motif Rack is a 16-part multitimbral synth module, employing Yamaha's long-established AWM2 sample-based subtractive synthesis, and capable of playing a maximum of 128 notes of polyphony. Each complete synth Voice (or Patch) consists of up to four split or layered Elements (think of these as oscillators) and up to two different insert effects. Voices can either be played singly, or from within Performances or Multis. Performances layer up to four Voices together, either split, layered or a combination of both, on a single MIDI channel. When played from within a Multi, Voices can be assigned their own MIDI channels for a full 16-part multitimbral sequencer-driven performance. The Studio Connections Initiative comes as a by-product of the long-standing alliance between Yamaha and Steinberg (now cemented by the Japanese conglomerate's recent purchase of the German firm). The initial aim is to integrate hardware-specific editing applications within software DAWs using Yamaha's Open Plug-in Technology (OPT) software format. In effect, this allows compatible hardware devices to appear within the DAW, and be edited or automated as if they were software plug-ins. All the hardware settings (or simply those for a single device) can be stored along with the sequencer song data and recalled instantly. This concept is referred to as Total Recall. Yamaha's Studio Manager software — if you have Steinberg's Cubase SX3, Nuendo 3, or Yamaha's own SQ01 sequencer, you can use them with this application to recall settings on compatible hardware. 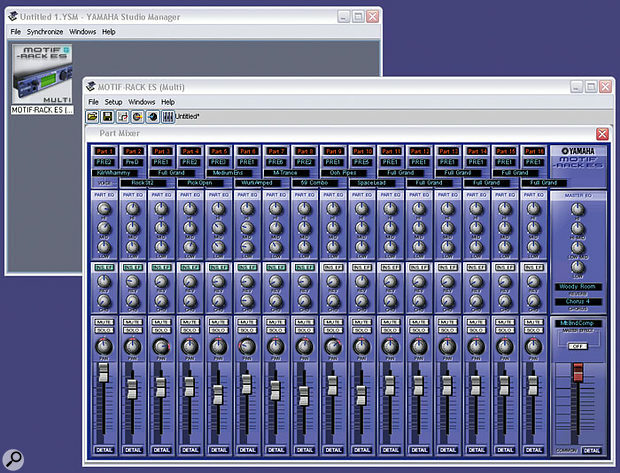 The software that makes this all possible, Yamaha's Studio Manager (currently at v2.1.2), is bundled on a CD-ROM supplied in the box with the ES. When installed, it can be directly invoked from within an OPT-compatible DAW, providing transparent access to, for example, a Motif ES voice editor, without having to run the editor as a separate, external application. Additionally, devices' editing applications can be operated remotely, meaning that a Yamaha 01X control surface, for example, could be configured as a hardware control surface for the Rack ES. So what products are able to make use of this system? Currently, the DAWs compatible with Total Recall are Steinberg's Cubase SX3 and Nuendo, while the hardware devices currently supported are Yamaha's DM2000, DM1000, 02R96, 01V96, the 01X and the Motif ES keyboard and Rack synths (note that the mixers are only compatible from OS v2 onwards). Also bundled on the CD-ROM are the Motif ES Voice Editor and the Multi-part Editor. At least they are both meant to be on the disk according to the manual — only the Multi-part editor was included on the review disc. In case you suffer from a similar problem, the missing ES Voice editor can be downloaded from www.yamahasynth.com, but if you're on a dial-up connection, be aware that it is a substantial 29MB download! The Multi-part editor, which provides on-screen editing of multitimbral performances, or Multis, did not exist at the time of the original Rack review, and appeared two months later, in August 2003. It's very welcome nevertheless, and is now at version 2.1. Curiously, Yamaha's OPT-compliant SQ01 sequencer for Windows, which was bundled with the original Motif Rack, is not included in the Rack ES's software bundle either. This can be downloaded from www.yamaha.co.jp/product/syndtm/dl/sq01.html, but it seems that you have to have installed all the previous revisions in order to upgrade to the latest version (v2), so again, be prepared for a lengthy download session! The software bundled with the Motif Rack ES is compatible with both Windows XP and Mac OS X (10.3 or later), and the USB MIDI driver is compatible with Windows XP/2000 or any Mac with a Power PC processor and a USB port. Users of other sequencers can still take advantage of Studio Manager 's Total Recall and editing functions by running it as a stand-alone application. Of course, if you're using it like this, it's not integrated into your main DAW application, so Studio Manager 's settings have to be saved as a separate file and reloaded manually when the song they refer to is required again. Plans are currently afoot to make the Studio Connections interface protocols available to other manufacturers so that they can develop compatible products. If everyone buys into the idea, then Yamaha/Steinberg's concept will be an attractive proposition; and even if they don't, it will remain a useful tool, if one limited to a narrow range of products. For more information, visit: www.studioconnections.org. Apart from the new grey livery, there are no obvious visual clues to suggest that the ES is significantly different from the original Rack. The panel legending sports only two minor additions, and the red LEDs are now yellow. The rear-panel connections remain unchanged — however, a journey through the Edit pages reveals a number of improvements. Possibly the most significant changes concern the effects. Firstly, the number of insert effects has risen from 107 to 116, whilst five new choruses have been added to the global effects, taking their total to 49. The most telling improvement is the way in which insert effects are deployed within Multis. On the original Rack, up to four parts could be specified to use the insert effects pair originally programmed for their assigned Voices. This is a good system, in that those particular Voices are guaranteed to sound pretty much the same in a Multi as they do when played in single Voice mode (although the Multi's global effects will also have a bearing on the way the parts eventually sound). Having only four insert-effectable parts could be seen as a little restrictive, so the ES has improved on this situation, allowing up to eight parts the luxury of their own insert effects. Add to this the global reverb and chorus effects, which are accessible by all 16 parts, and the ES begins to look extremely well endowed, with 18 simultaneously available effects. Further improvements include a new Master Effects section; this can be applied across the combined stereo output of the ES. Eight types of Master Effect are provided, including a multi-band compressor as well as various options such as a delay, lo-fi processing, distortion, a dynamic filter, a ring modulator and an audio 'slicing' effect. When the ES is in Voice mode and the Master Effect is engaged (via the Utility menu) this effect will be applied to any Voice that is subsequently selected. In Multi mode, each Multi can utilise (and store) its own Master Effect, or bypass it altogether. Of these effects, the multi-band compressor would seem the sensible choice with which to treat a complete multitimbral performance, whilst the other effects are arguably more suitable for playing single voices. Nevertheless, having played complete mixes through the each of the effect types — the lo-fi and distortion were rather fun — I can see why the more radical and experimental amongst you would disagree! In addition to the Master Effect, a five-band master EQ (situated after the Master Effect in the signal path) is similarly applied across the combined stereo output, and this is permanently 'on'. The low and high bands can be switched from peaking to shelving types, whilst the middle three bands are all peaking types. In fact, the EQ facilities of the ES are extremely comprehensive and flexible — the new Master EQ is in addition to the existing two-band per-Element EQ and the three-band per-Part EQ in Multis — to say nothing of the additional EQs found on the insert effects. On the original Rack, only basic offsets (cutoff, amplitude envelope, filter envelope) could be applied to each Voice as a whole in Multi mode. The ES, however, allows for detailed Multi-part editing at the Element level, in the same way as on Roland's JV, XP and XV synths, for example. Drum parts can still only be edited from within a Multi at the Common level though, unlike the Roland synths. If you want to edit the drums on a per-key basis, or create customised drum layouts, you must do this in Voice mode and store the results to a User drum patch first. An unexpanded, out-of-the-box Motif Rack ES is a 16-part multitimbral unit, as was the original Rack. However, the USB driver supplied with the ES has a new trick up its sleeve: multiple output ports. Eight virtual ports are made available from within your host sequencing program — so what are they for? 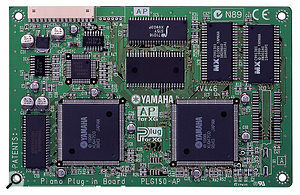 If your ES is fitted with PLG expansion boards, the main unit and each of the PLG boards can be addressed on its own virtual port, and therefore its own unique MIDI channels. In the case of the multitimbral PLG100XG board, this means a completely independent set of 16 extra MIDI channels. So, with the PLG100XG installed, together with one other PLG board, the ES is capable of playing on up to 33 MIDI channels at once, clearly demonstrating the advantage of using the USB connection. However, it should be borne in mind that if you intend to do SysEx dumps from the ES into, for example, Sonar 's integral SysEx librarian or a non-USB hardware sequencer or data filer, these still have to be performed over a standard MIDI connection. The number of Preset and User banks has been augmented on the ES — there are now six Preset banks plus one GM bank, giving a total of 896 presets. A third User bank has also been added, bringing that total to 384. The number of Drum kits remains the same, at 65 presets and 32 User kits. A further change has been implemented in the arrangement of Performances and Multis. On the original Rack, there was a library of preset Multis, split into two banks. Of these, Bank 1 contained 59 Performance types, while Bank 2 provided 65 Multi types. Any of these presets, when edited, could then be saved to the User Multi bank. If this sounds a little clunky, then Yamaha obviously thought so too — the ES now has separately defined Performance and Multi banks, each filled with 128 presets, all of which can be overwritten. This makes much more sense; preset Multis are useful for demonstration purposes, but are highly likely to be overwritten in the long term... right? Timing Problems Over MIDI Yes Cured! The arpeggiator on the original Rack was fairly well stocked with 256 assorted patterns, but unlike its keyboard version, had no user-definable arpeggios. The ES still has no user-definable patterns, but instead has upped the number of patterns to a whopping 1787. These are grouped into 18 different categories, including not only 'traditional' arpeggios, but complete musical phrases, lead lines, bass lines, guitar strums, drum patterns, and even some 'noteless' arpeggios containing only controller data — think gated effects and the like. Up to five different arpeggio patterns can be stored along with each Voice, Performance or Multi. Any one of these five patterns can be selected while the arpeggio is playing, either manually using the Page buttons or by external control change messages, allowing for automated pattern changes in a sequence. Five little boxes at the upper right of the display indicate (with a note icon) which of the five slots have arpeggios assigned to them. If a new slot is selected while the arpeggio is in the middle of a phrase or pattern, its note icon turns to an arrow to indicate that it will be taking over at the beginning of the next measure, allowing for seamless changes. This is a really neat idea, and makes it all the more of a shame that Multis can still only use one global arpeggio at a time. If each part could run its own patterns, there would be much potential multitimbral fun to be had. Nevertheless, the arpeggiator's output can be recorded into a sequencer, so you could always build up a song in this way part by part. Like the original Motif Rack, the ES can be expanded with one or two PLG expansion boards that work in tandem with the module. These boards host completely independent synths, increasing the total polyphony (dependent on the board type) and utilising their own independent effects DSP. The review Motif Rack ES was supplied with the recently released (and usually optional) PLG150AP, a dedicated piano board boasting a 64-voice polyphonic, 29MB reproduction of a Yamaha CF3S Concert Grand, employing three velocity layers to cover the dynamic range from pianissimo to fortissimo. The board comes with 32 presets, with room to store 64 of your own custom variations. The presets cover the ground you would expect — bright, medium and dark versions of the basic piano, along with honky-tonk, EQ'd, chorused and variously effected renditions. So how does it sound? Piano sounds are invariably subjective, and while the pre-packaged pianos usually found in synth modules are useful, they are rarely comparable to dedicated stage pianos or the giga-sized piano libraries we've now become used to, especially when played in isolation. That said, the piano that comes as part of the standard Motif waveform set is easily amongst the better offerings. Comparison with the PLG150AP board reveals the PLG version as being generally louder, having a bigger, rounder low range, more body in the mid range and slightly less 'fizz' in the upper frequencies. It responds well to EQ, as the presets demonstrate — this piano can be made to sit at the back of a mix or to force its way to the front without too much difficulty. My personal taste would lead me to wish that the tonal difference between the quietest and loudest samples was more dramatically stated — playing hard doesn't quite provide enough excitement or 'energy'. Although Yamaha claim that the samples have 'long loops', the notes' decay seems a tad on the short side, and trying to compensate by increasing the Amp EG Decay time doesn't actually make any difference, as the samples' decay amplitude seems to be written in stone — a characteristic I seem to remember also affecting Roland's SRX piano expansion board. You could always apply a little compression to flesh out the body of the tone, but you'll never make the notes any longer. As a consequence, I was reaching for the reverb send level to try and extend the notes' length by any means possible! The new PLG150AP optional piano expansion board. 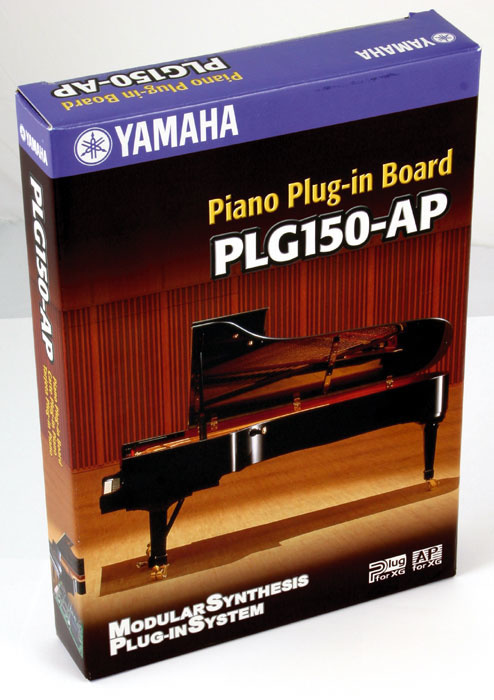 Despite these niggles, both the Motif's internal piano and the PLG150AP stand up very well against the competition, and the PLG board has the benefit of its own 64-note polyphony, which will be indispensable to anyone using any of the Motif range to produce piano-heavy arrangements. PLG150AP (Yamaha's CF3S concert grand piano). PLG150DR AWM2 (drums with dedicated effects). PLG150PC AWM2 (percussion with dedicated effects). But for many reading this, the big question is: does the ES play in time over MIDI? Well, I'm delighted to report that the ES's timing is good. In fact, it's astonishingly good. In the previous tests on the original Rack, its timing was compared to that of other MIDI modules, which generally have an inherent latency to them, as we know, but which nevertheless performed very favourably compared to the Motif Rack! On this occasion, the Rack ES was subjected to a potentially cruel and unfair test — its timing was compared to that of a virtual instrument plug-in (in this case Cakewalk's TTS synth). For those who aren't aware, virtual instruments have virtually no latency when played back from a sequencer. The ES was bombarded with one of my mind-numbingly trite, yet action-packed multitimbral test ditties. The drum part was copied to a separate track and assigned to the TTS synth, which played along with the ES. The result? The two drum parts stuck to each other like glue. No obvious flamming, no hesitations. I wouldn't go so far as to claim they were phase-accurate, but they were as close as you could reasonably expect — and certainly as tight or tighter than the other hardware MIDI instruments in my rack. Bearing in mind that sequencers prioritise tracks according to their position in the track list, I moved the ES's drum part from track 2 to track 16, at the bottom of the list. Incredibly, the timing remained just as solid as before. These tests were performed using the ES's five-pin MIDI connections and the USB connection. In order to accurately measure the difference in response time between the TTS virtual synth and the ES, the drum part from the TTS synth was rendered to audio, as were the various MIDI/USB/track number variations of the ES drum part. Surprisingly, there was virtually no difference in timing between the ES's MIDI and USB port outputs. And best of all, the average difference in timing between the ES and TTS was in the order of between 4ms to 6ms. So yes, it looks like Yamaha have got the timing problem well and truly licked. Despite plenty of competition, the Rack ES offers a great deal to sway prospective buyers. 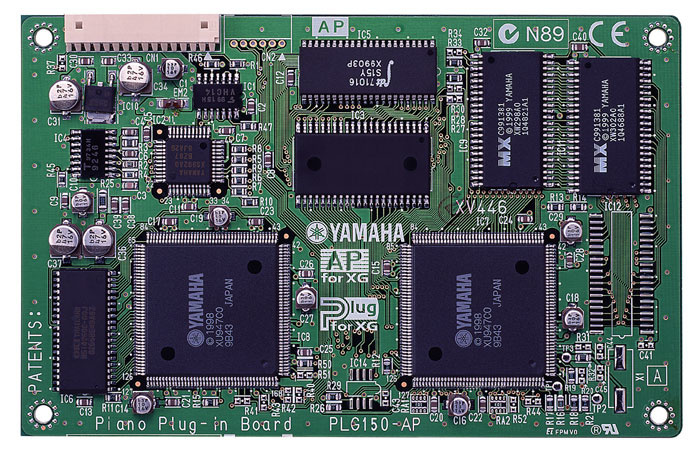 Fully expanded, it can perform not just 16 but 33 parts simultaneously if a PLG100XG board is present, with a theoretical maximum polyphony in excess of 192 voices. These same boards can provide additional forms of synthesis — Virtual Analogue and Virtual Acoustic for example (see the box above). The global and insert effects are of exceptionally high quality, with a generous eight simultaneous insert effect pairs available in Multi mode, and the overall sound quality is very appealing, aided in no small part by the well-compiled, colourful sample waveform set. Whether you're into prog rock, acid trance, tote bag or geek pie, the ES comes loaded with presets that will fit the bill. For sound designers, the bundled (or freely downloadable) editing software makes creating your own custom sounds a breeze. Most importantly, the timing problems that beset the earlier Rack have finally been vanquished — the ES now plays back as tightly as a ...well, a very tight thing. The UK price of the ES is £949 — just a tad over the £925 of the original Rack — which means you get all the new enhancements for a mere £24 extra. If you have been teetering indecisively on the knife-edge of purchasing a Motif Rack, then teeter ye not; go out and get the Motif Rack ES. Does not suffer from the MIDI timing problems affecting the original Motif Rack. An extremely versatile synth module. Insert effects doubled to eight in Multi mode. Multiple USB output ports allow up to 33-part multitimbrality with PLG boards installed. Bundled Studio Manager and editing software allow full integration with compatible DAWs. No editing of parts at element level from within the Multi-part editor software. No per-key editing of drum parts within a Multi. Two years ago I liked the original Motif Rack's vibrant sounds and its potential for expandability via PLG boards. The many minor improvements in the Motif Rack ES, such as the doubling of simultaneously addressable insert effects, have made the Rack ES an even more versatile creative tool. But the real winner is the resolution of the original Rack's MIDI timing problems, allowing me to give the Motif Rack — in its ES incarnation, at least — a thoroughly enthusiastic thumbs-up.